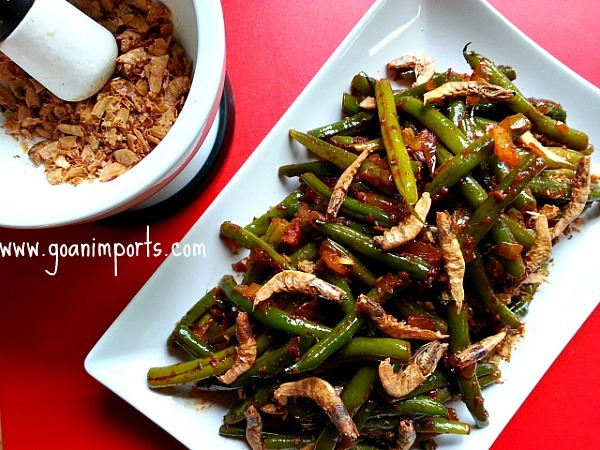 I got inspired to do this Goan green beans recipe as I love the Thai green beans with shrimp paste. Since Goan food does use spices and seafood a lot I thought it would be great to give it a try and I was pleasantly surprised by the outcome. Got hubby’s approval who is a picky eater if I may say, he took it for lunch the next day with some rice and Goan fish curry. The reason recheado masala works for this recipe is because this Goan spice is spicy, has a lot of ginger garlic along with some more spices and is ground in vinegar. 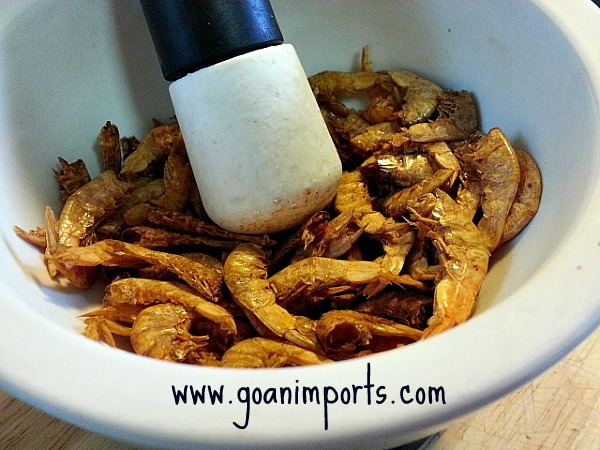 Goan recheado masala also is used a lot with seafood in Goan recipes. This recipe can be done for vegetarians and for non-vegetarians. 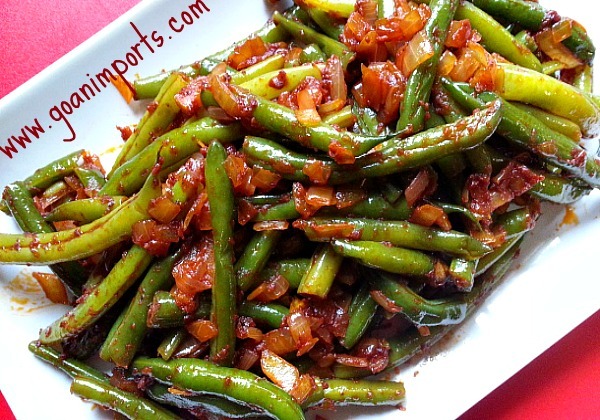 Goan food mostly comprises of meat and fish and it hard to find vegetarian recipes but this recipe of green beans will surely not disappoint and is addictively good. I used 1/2 cup of dry small shrimps that can be found in any Spanish or Asian markets. You need to roast the shrimps first on a non stick pan for 4-5 minutes on medium heat till they are crisp. Keep tossing them in the pan as they easily get burnt. Pound the roasted dry shrimps coarsely. You can skip the above step if you want to make it as a vegetarian recipe. * Heat about 4-5 tbsp of oil, to it add the chopped onions and saute till transparent. Next add the recheado masala, tomato paste, sugar and saute for 1-2 minutes. * Then add the green beans, saute and cook covered for 8-10 minutes by stirring it occasionally or till the green beans are cooked but still crisp. * To make it non vegetarian add the pounded shrimps and saute till mixed well. Serve it with plain white rice. 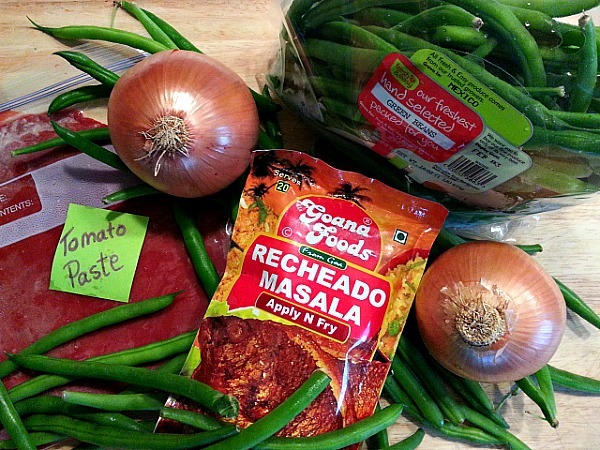 This recheado masala looks so delicious and so versatile! I will definitely look for it! Thanks Much Jackie, they do taste really good. Yum! This looks so good, and perfect for the green beans that are going crazy in my garden! This is something different that I can’t wait to try! Thank you Nancy:-). I hope you do try it. Sounds yummy, will surely try this recipe. Thanks Priya, Hope you enjoy the dish. Mmm..this reminds me of Sechwan beans, (my favourite), only Goan style! I will have to try them! Thanks! Thank you chefjulianna, I hope you do try it :-).